The Great Catch-Up: NORTH! Springer to Neel Gap. 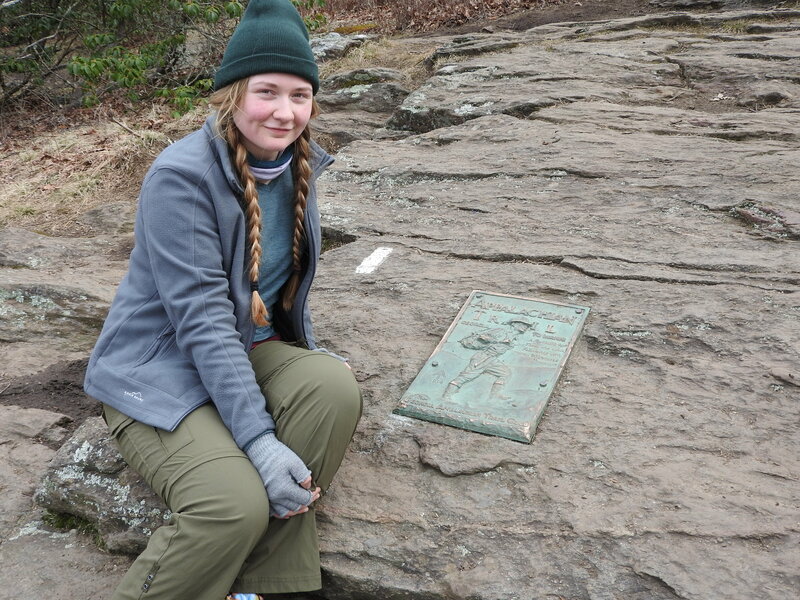 After a long flight, a roadtrip, and the AT Kick Off, I was finally ready to start my hike on Springer Mountain! On the morning of the 7th, I woke up early, nervous but looking forward to finally getting to do what I’d been planning for months. I talked to my boyfriend on Skype for a little bit, then had pancakes with my dad. Justin, one of the hikers I had met at the Kick Off and who was staying at the same campground, walked over. Together, we drove down to the visitors center once more, this time to meet with Ladybird and her mom.. and snap a few pictures at the Approach Trail. When all our (too heavy) packs were loaded in to the back of my dad’s camper and we were all loaded in to the front, it was finally time to hit the road and drive to Springer Mountain. On the map in AWOL’s guide, it all seemed easy. Except we took the wrong exit, ended up on a severely under-maintained forest service road, and drove aimlessly for what seemed like at least an hour. Once we hit an impassable part of the road we decided that this couldn’t be the way to Springer.. and turned around. We did reach the parking lot near Springer eventually. All of us, three hikers (without packs) plus two parents, hiked up Springer and.. it was tougher than I had imagined. All I could do was think oh crap, what have I gotten myself in to? If the whole trail is like this I’ll never make it! while my new-found hiking buddies moved further and further ahead of me. I did make it to the top, however, and disguised my slowness as me waiting for my dad to catch up. The summit was decidedly anticlimactic, with no views to speak of. I didn’t care. I’d made it up my first mountain! We took the obligatory pictures, I ate a snack, and we headed back down again. With our packs now on we said our goodbyes to my dad and Ladybird’s mom and then the three of us crossed the parking lot, back to the trail. And headed North. I ditched the fleece jacket pretty soon after. The first few miles after Springer were beautiful. The trail twisted and turned through rhododendrons and we were all soon warm enough to take off our jackets. We talked a lot about a whole bunch of things – first and foremost, of course, the trail. It felt like we had all known each other for a long time and we had only just started out. We took our first break at 11:30 am. I had my first tuna-on-a-tortilla lunch, trying to figure out how best to get the tuna out of the packet and finally realizing it was easiest to just cut it open instead of trying to squeeze the tuna out. We did our first pees in the woods. We saw our first ridgerunner. It was great. Everyone we ran in to was so excited and so friendly, like an all day outdoor Christmas without any of the stress. That day was also the day I gained my trail name: Onceaday. Why? At one point while hiking I was completely distracted and not paying attention to where I was putting my feet. I slipped, and as though in slow motion, felt my pack weight dragging me down to one side.. and I fell. That happens, right? My friends quickly pulled me on to my feet again and everything went on as usual.. until I almost slipped again. And again. And again. And my friends quickly came to tell me that I was only permitted to fall once a day. I have, so far, lived up to that name. Ladybird and Justin. SO EXCITED! Sometime in the afternoon we ran in to another hiker, a lone girl with a single trekking pole, who I learned was later named Tweedy. She was quickly added to our merry band of hikers and we set out once more, now four instead of three. The weather was great all day and we stopped mid-afternoon at Hawk Mountain Campground, 7.4 miles in. Deciding that the shelter, a little further on, would be far busier, we decided to stay there for the night. We went to get and filter our water for the first time and cooked dinner together for the first time. It felt like a picknick. I have to admit that that evening I was not feeling great. I had a bad headache and a blister because I had been pushing myself up the hill to match my friends’ speed. I could keep up on all the other parts, but I definitely struggled with uphills. I knew that I was going to burn out fast if I kept trying to match their pace, and it made me sad. The next day was Ladybird’s birthday and she preferred to start it off on her own, so she set out early without us. Tweedy and Justin waited as I had breakfast, having gotten up later than them. 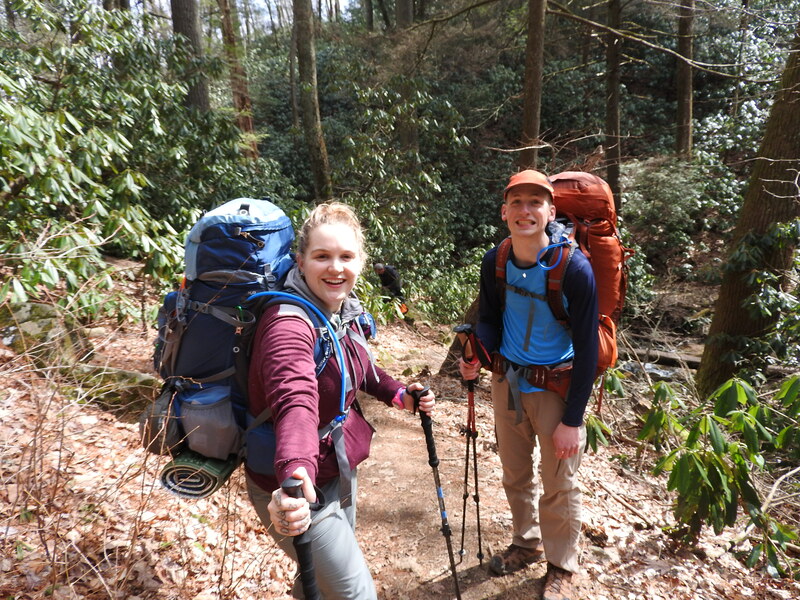 When we hit the trail it soon became obvious that I wouldn’t be keeping up for long, and so I told them to go ahead without me and that I would meet them at Gooch Mountain Shelter, 8.4 miles from where we had camped. About a mile out from the campground I found a spot with cell service and talked to my boyfriend on facebook. We were both having a rough time, and talking about it helped. Around that time a hiker named Hey Everybody came by. He was a Hikertrash Trail Maintenance ambassador and he talked to me about graffiti in shelters. When I solemnly swore that I would not write stuff on shelters, he gave me a small bag of jerky. It was my first taste of trail magic and it tasted great. Selfies on windy mountains are harder than they look. With my spirits sufficiently lifted it was time to tackle the trail again. I struggled a LOT on the uphills but found they were a lot easier once I started listening to music (the soundtrack to Dr. Horrible’s Sing Along Blog. I would recommend it to anyone). I met my dad at Cooper Gap only to find out that he had been playing the trail angel already and handing out Gatorade to thirsty hikers. I took the opportunity to leave behind some of my superfluous gear, grabbed a couple more snacks, filled up on water, and talked to two other girls who had just come through. After this much-needed break I headed on. 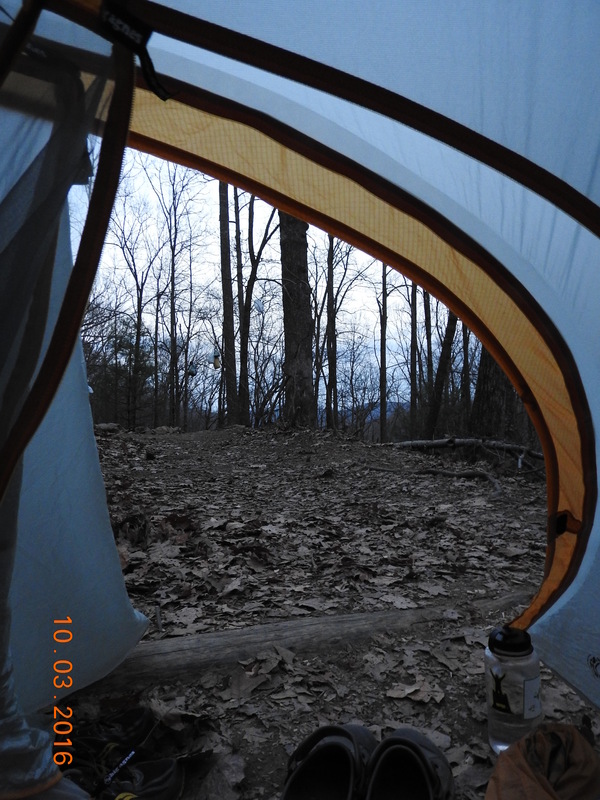 I had decided that making it to Gooch Mountain Shelter would be quite a push, and that I should probably aim for Justus Creek, a campsite 1.4 miles before that. I was tired and overwhelmed with new experiences and I have to admit that I had a minor freakout at one point, but I persevered and made it to Justus Creek around 4:30 PM. With about an hour of daylight left, I gritted my teeth and pushed on to the shelter. Once there, I was warmly welcomed by my hiking friends from that morning. Ladybird, Tweedy, Justin, and even Hey Everybody were there. I set up my tent on one of the only patches of ground not yet occupied. It was a pretty bad slope, but I was tired enough not to care, and hungry enough that I was convinced that all my problems would be solved by eating dinner. In all my struggles that day I had almost forgotten that it was Ladybird’s birthday. As soon as I remembered, however, I dug in to my pack to find my emergency firestarter kit: two lighters and a couple of birthday candles. One of the candles was donated to the cause, and everyone else at the shelter helped out. Tweedy had made a crown of leaves, Hey Everybody had procured some whisky, Justin had rice cakes and another hiker named Bambi had chocolate milk mix that he mixed with just enough water to turn it in to the perfect frosting for a rice cake. Ladybird was crowned by the leaf wreath and presented with the chocolate covered rice cake (with a birthday candle!) and we all sang for her. Later, we sat around the campfire, listening, enraptured, to the stories of a hiker named Lord Bearclaw. For instance, there was the story of how he killed a bear with a spear from a tree when he was younger. Or the one where he met the Fonz and got him to sign his plastic shark. He was a very interesting character. That night, as I figured out how to work a bear cable in the dark (with a lot of help from Ladybird), I figured that maybe, just maybe, I could do this whole hiking thing. When I woke up, I felt thoroughly uninspired and so I stayed in my sleeping back and read The Help on my ereader. I managed to get up just in time to see my friends off, knowing full well that I probably wouldn’t see them again. I would be meeting my dad at the nearest gap and we would go in to Suches. I made my breakfast and searched for my toilet paper.. but couldn’t find it. That made the visit to the privy a little more interesting. 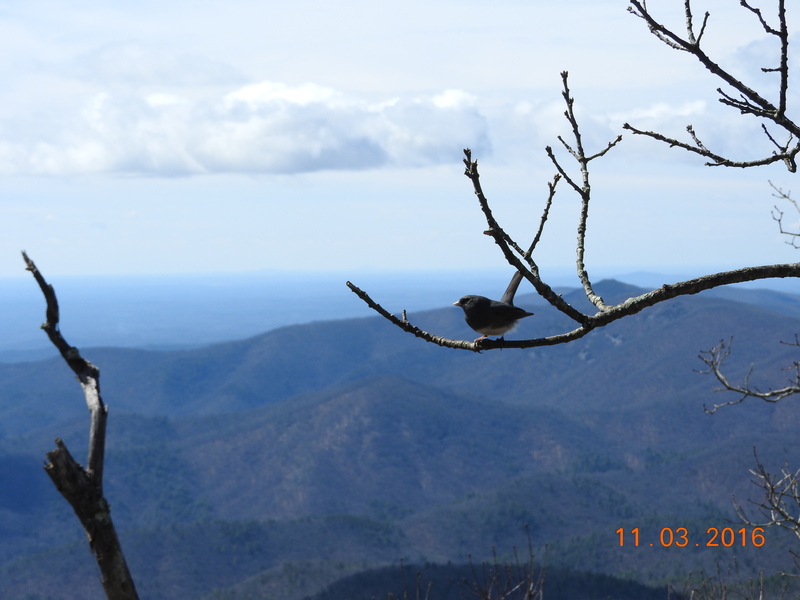 Once I returned, two other hikers had shown up. They were a brother and sister duo from Colorado and we ate breakfast together and chatted for a little while. That day, my strategy was slightly different; instead of listening to music, I would give the audiobooks I had downloaded a try. It was actually very pleasant, strolling along lazily while listening to Harry Potter’s adventures. I stopped for lunch on top of Ramrock Mountain and had another tuna tortilla. I was beginning to ease in to feeling like a hiker. I already knew my favorite flavor of tuna (ranch! ), for instance. That felt like a very hiker sort of thing to know. My mental state was worlds away from where it had been that morning or the day before. I was at Woody Gap before I knew it and my dad was waiting for me with donuts. We drove in to Suches, which was not much of a town, and stopped at Wolfpen Gap Store which also happened to be a hiker hostel. It was run by a woman named Becky, whom I had met before at the AT Kick Off. I changed in to some clean clothes from my dad’s camper and chatted a bit with Miss Janet, who was standing outside. Finally, we went in to the store for pizza and Gatorade. I spent the night at the hostel as one of only two hikers. The other was an ex-marine by the name of Ghostrider. He mentioned that he had started out with a 60lb pack and I was in awe.. as well as happy that I didn’t have the heaviest pack on the trail. My next day was going to be a short one. 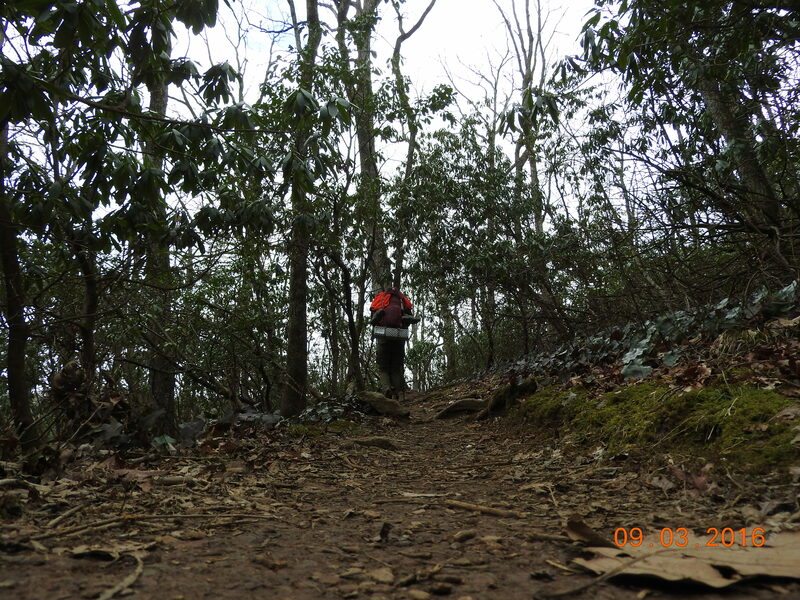 I would stop at Lance Creek, maybe four miles from where I had left off, because the section from there to Neel’s Gap required a bear cannister and I wasn’t sure I would be able to do the whole section in one go. Apart from one tough climb it was a fairly easy walk and I got to Lance Creek with plenty of time to spare. When I got there, there was plenty of room to set up my tent, but the place quickly filled up. I wasn’t the only one who was waiting to tackle the next section until the morning. After dinner I found myself with a problem I didn’t think I would have in the woods.. there was no real place to pee – for a woman at least. The campsite was stretched out on a sort of ridge, with the water source at the bottom of the hill (no peeing there) and a fairly steep, sparsely wooded incline above it. Finding a place where I wouldn’t be showing the world my backside would require a mile of backtracking, and I didn’t feel up for that. 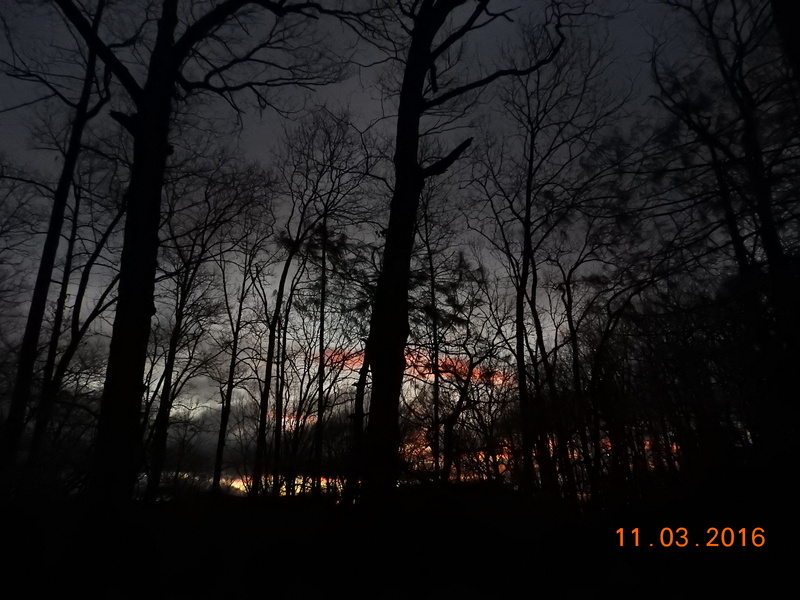 Even after discussing tactics with another female hiker my only solution was to wait until it was dark. Since then I have not run in to a campsite where it was as hard to find a spot as Lance Creek. Let it be known. Waiting for dark so I could finally pee in peace.. I had my alarm set for 5 AM the next day so that I could see my first sunrise on the trail. After my oatmeal and dried fruit (yum, thank you Crispy Green) I set out with another hiker named Quasimodo. After about three minutes of uphill, I told him he should probably go on without me and he was out of sight within minutes. I struggled for the first mile or so – it was a long uphill and my calves and tendons were complaining hard. After a while, however, it got better. I think it just took me a while (and a lot of rice crispy treats and Harry Potter) to warm up. 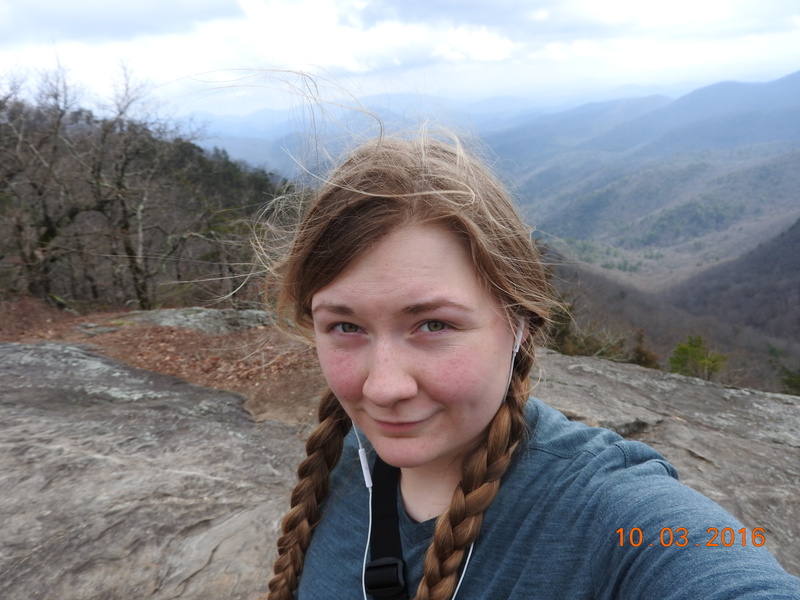 I was at the foot of Blood Mountain before I knew it and the climb was not bad at all. Sure, it was enough for me to get out of breath but I could keep moving without having to constantly take breaks. My summit of the mountain was a very dramatic one because I did so right when, in my audiobook, Harry defeated Voldemort for the first time. I could not have asked for better timing – or better weather, for that matter. The sun was bright, there was a cool breeze and everyone at the top of the mountain was in a great mood. There were views for miles. 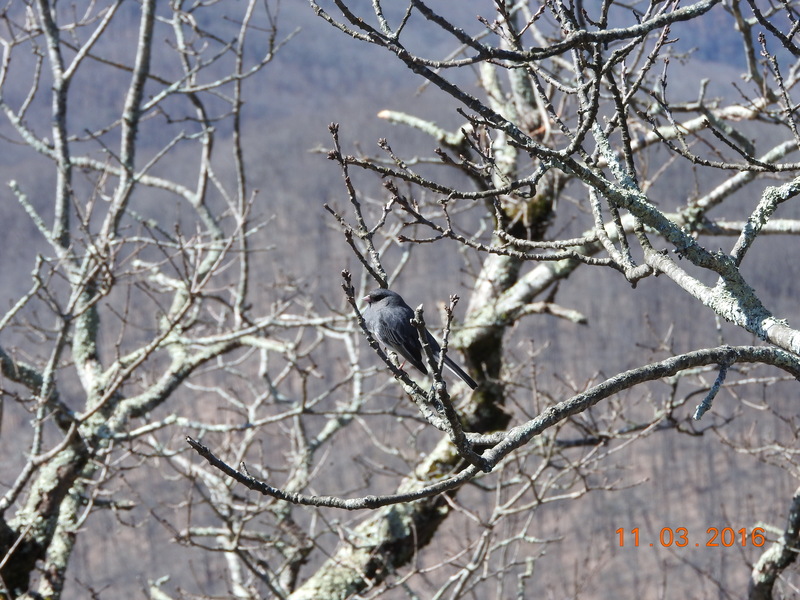 I took my time eating some lunch, making pictures of a bird that was hanging out in the area, and playing with the remote picture options on my camera. Finally, I headed down the mountain again. Turns out, that’s the hard part of Blood Mountain. The downhill took seemingly forever and once I thought I was finally at the bottom, I turned a corner and.. there was more downhill. After what seemed like hours, the road came in to view and with that, the Mountain Crossings outfitter.. and my dad! I'm Linde, a twenty-something Dutch-American hybrid. I grew up in below-sea level Holland, always looking forward to the summers spent in national parks across the USA. Nowadays I play with swords, make puns, read books, eat doughnuts, make pictures, have a bachelor's degree in cultural anthropology, and the love for the outdoors never left. Onwards to Maine! 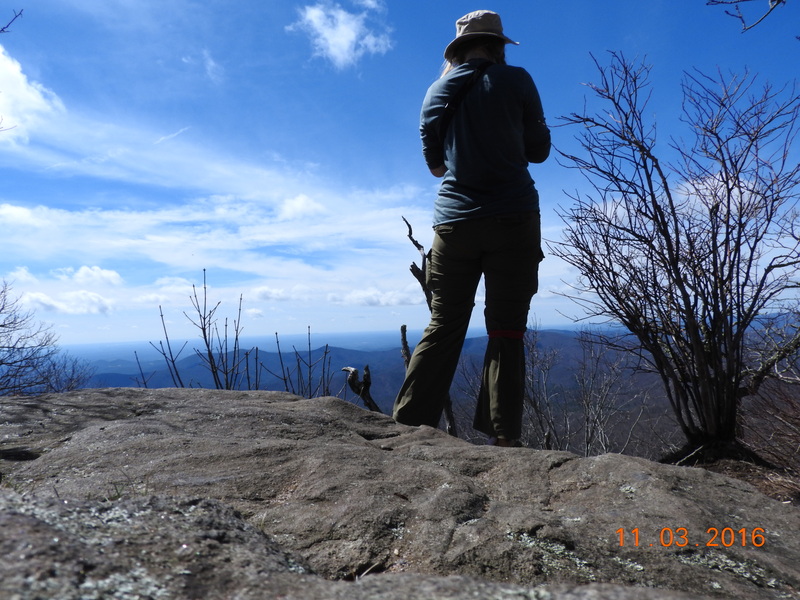 Interesting … an honest report of all that goes through the mind of a new AT hiker. Reminded me of my first few days … and I got a blister on Day One, too. I hope you took care of that and it doesn’t trouble you further. Good luck on the hike. Sounds like you are getting the hang of it and building some legs. Blood Mtn … yes, the downhill is the killer! I love reading your updates. Your honesty and candidness are refreshing. Keep ’em coming!